These sculptures represent pottery designs and shell carvings from our ancestors of the Southeast. In earlier times it was common for our ancestors to carve and fashion shells into personal adornments such as earrings, armbands and necklaces. Shell ornaments or gorgets were traditionally made from large conch shells and worn around the neck by men and women. These disks depict the sun, four directions, spider and woodpecker—each one, an important aspect of Mississippian Culture. SUN—represents the Creator. The Creator is the giver of light, life and spirituality. CROSS—represents the four directions, four seasons and the logs of the Sacred Fire. The smoke from the fire is believed to take our prayers to the Creator. SPIDER—comes from an ancient oral tradition. The story tells of how Spider brought fire to mankind in a mud bowl on her back. The fire baked the mud and created a clay pot. During Chickasaw Removal, keepers of the fire brought its sacred embers in clay pots across the trail to Indian Territory. WOODPECKER—is a warrior motif. 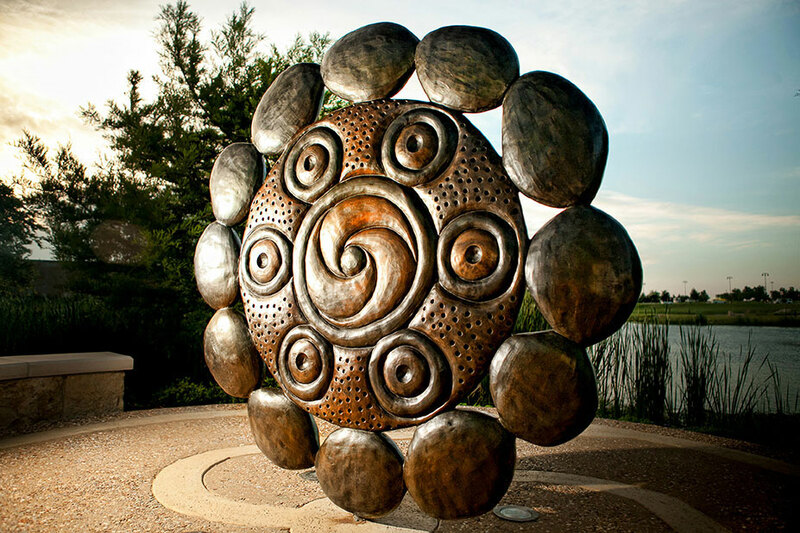 It symbolizes the strength, courage and determination of the Chickasaw people.